Strawberry Farm | Strawberry Picking in La Trinidad | Go Baguio! One activity that is highly recommended is strawberry picking at the Strawberry Farm in the nearby La Trinidad, Benguet. A unique experience for the whole family, you get to pick fresh strawberries -- right alongside the Ibaloi farmers -- to bring home or consume while on vacation in the Summer Capital of the Philippines. 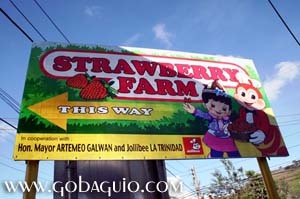 Located just 30 minutes from Baguio City, Strawberry Farm "opens it doors" for the activity from November to May every year. The rates for strawberry picking vary. In general, it costs twice the market price to pick your own strawberries, which folks find strange, especially those who have tried apple or orange picking in orchards in other countries thinking they provide "free labor." The difference here is that strawberries are a very delicate fruit compared to apples and oranges and a lot are actually ruined or wasted when harvested by 'amateurs.' So half the cost is for the strawberries, and the other half is for the activity itself. There's no minimum amount per person, by the way, they just weigh how much you all have picked together and you're charged for it. All in all, strawberry picking "Baguio style" is an experience well worth it as it is the stuff that warm childhood memories are made of -- priceless even! 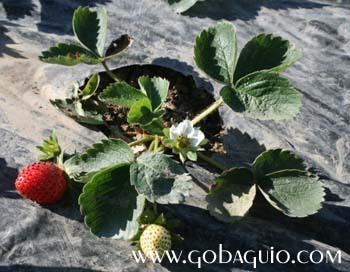 Location: Strawberry Farm in La Trinidad Valley, Benguet, less than 10km from the center of Baguio City. View our new searchable map to find its location. By car: From Session Road, turn right to Magsaysay Road and turn left at the stop light (to your right will be Baguio Center Mall). The road you will be on is still Magsaysay Road and this connects Baguio City to La Trinidad. Just keep going straight, passing a vehicle flyover at one point, until you see the welcome arch of La Trinidad. so just keep looking out for it. By jeepney: If going by public transportation, jeepneys to La Trinidad wait for passengers in the Gen. Luna area near the University of Baguio. Tell the driver to let you off at the Strawberry Farm, cross the road and walk the rest of the way as it's not that far from the main road.